I'm 55 and I really don't remember these panels being gloss black when I was a kid. I seem to remember being careful not to wax these panels because wax really messed up the semi gloss. My 2 cent recollection of ancient history. This debate has been raging for many, MANY years and it won't get settled until original Fisher documentation is found (if ever). While I have a lot of respect for Jerry, William and Charley, I also believe (my opinion only) that the black was semi gloss based on pictures from the 1968 CAMARO DEALER SALES ALBUM. This is clearly a semi gloss finish. However, I don't have the 1967 or 1969 Dealer Sales Album, so I can't say what those pictures show, if anything. The Camaro wasn't the only car in the model line to use black accents. The Chevelle, Nova and Corvette also used black accents and these are known to be semi gloss. Why would Chevrolet make every car EXCEPT the Camaro semi gloss? Not only that, but just about every US automaker had cars with black accents, and these are all known to be semi gloss. Take a look at any Mustang or Chrysler muscle car from the late 60's, early 70's and you'll see what I mean. Our own WEB site also states the black was SEMI GLOSS, but if and when actual paint instructions are found, this won't go away, so paint it whatever amount of gloss you feel comfortable with. Just be aware that if you have your car judged, you'll be wrong no matter what amount of gloss you use!! 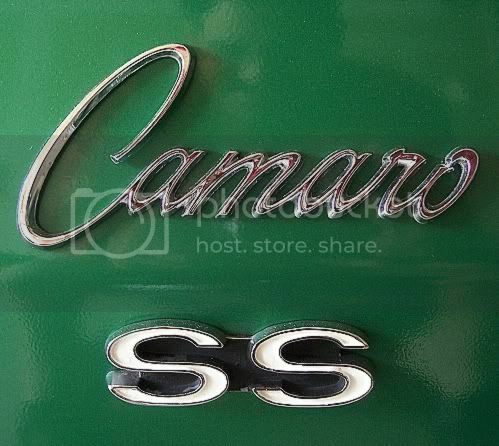 My 2 cents: In the summer of 1969 a guy on my street bought a brand new 1969 SS 396 right off the lot. Body color was white. Rear tail panel was semi gloss black. I saw many of these cars in my youth as well, and if you would ask me, I would swear they were semi gloss or a somewhat flat black also. But now that I'm reading this thread, I have to admit that I'm not really so sure any more. It's been a long time and the memory can play tricks. Orig paint low mile 68 L78. I'll go against the grain with this one too - I saw hundreds of them coming down the line at Norwood iin February and March of 1969, and I never saw one that was gloss black. Then someone show me a survivor , orig paint car with semi gloss paint. Rear panel blackout, stripes and rocker trim black out on style trim cars was done in the in line repair booth after the car had been painted and firewall had been blacked out in the blackout booth at the end of the paint shop. How many colors of black did they have in the repair booth, a gloss for the stripes and rocker panel blackout (never heard anyone question the gloss level here) and a semigloss for the tail panel? I called DuPont auto refinish and got the following reply. Use croma one single stage acrylic urethane in code 99G black. You should get satin black as original. I'm 62 years old and remember when the cars were new but I don't remember them being gloss. But that was along time ago. There's only one I've seen recently that was OP in the jambs (the jambs and behind the bumper are the areas to really judge IMO because you never really know how much the "exposed" areas have been rubbed/buffed in the 40 or so years), the rest of the car had been repainted. I would have to go back and look at it again closer, especially on the trunk-side weatherstrip lip, but the pics I have are definitely not gloss. We restored an OP BB car about 10 years ago, way before dig pics (only have a couple film pics of it anymore) and my memory is no help. The one pic I do have shows no reflection. I've also seen satin OP rocker paint, behind the fender where there was never any sun exposure. So.... I really don't know. Maybe it was an inconsistent deal? What would be the correct sheen for the rockers on RS cars? Gloss or semi-gloss? Semi Gloss on both the rockers (Z22 Rally Sport cars), and the tail pan (SS Big Block cars).